himfunshi Wildlife Orphanage operates entirely on donations and sponsorship, without the financial support provided by our valued Donors, volunteers and visitors, the sanctary and its inhabitants could not survive. To those who wish to begin supporting our programs we offer various ways for you to do so. 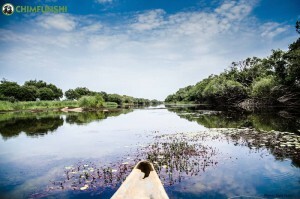 Chimfunshi offers a variety of sponsorship programs to suit your interests, all of which will bring great benefits to the environments, wildlife and the communities within which we work. Chimfunshi Wildlife Orphanage Trust is one of the largest chimpanzee reserves in the world and is internationally recognized as such. Chimfunshi is home to 120 chimpanzees, most of them living in 4 large forested enclosures, and as close to their natural environment as possible. Be intrigued by humans’ closest relative; learn about our similarities from our knowledgeable Keepers. you will receive a sponsorship certificate, a photo of your chimpanzee and the Chimfunshi newsletter. and help provide a better education to our next generation. 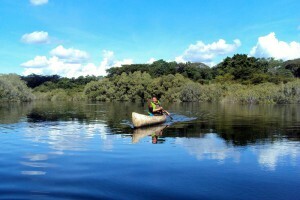 and improve access to basic health care to this isolated community. to be able to continue rescuing chimpanzees from inhumane circumstances and illegal activities such as the bush meat and smuggling trades, which sadly still exists today. Chimfunshi started as a family-run wildlife orphanage in the north of Zambia, and today Chimfunshi is managed by a Board of Trustees to ensure the long-term sustainability of the Sanctuary. Chimfunshi was founded in 1983 when a game ranger brought a badly wounded infant chimpanzee to the cattle ranch of David and Sheila Siddle. 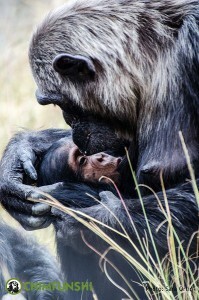 The Siddle’s nursed that chimp – named „Pal“ – back to health, thereby establishing a tradition of care and respect that forms the legacy of the sanctuary. Once word of Pal’s recovery spread, the Siddle’s were inundated with orphaned chimpanzees. Although many of the chimpanzees were confiscated from poachers who attempted to smuggle the infants into Zambia for sale as pets, an equally large number were rescued from dilapidated zoos and circuses from all over Africa, Asia, Europe and South America. With 120 chimpanzees, Chimfunshi is now one of the largest chimpanzee sanctuaries in the world. In 2002, an Education Centre was built to provide a facility to teach the youth of Zambia about ecology and wildlife conservation. Local and international students researching group behavior and ethnic studies also use it. In recent years, Chimfunshi has evolved into a major centre for education and research. 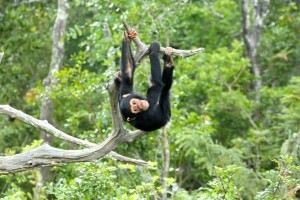 The sanctuary offers the unique opportunity to observe the complex social behaviour of chimpanzees in their almost natural habitat and in large social groups. It also allows a number of social and educational projects in the field and a chance to get to know the people and culture of Zambia. Animal welfare and research thus compliment each other perfectly: primate researchers from around the world come to Chimfunshi to investigate the chimpanzees’ social behaviour, communication and cognition. Researchers conduct observational studies, while learning about the daily lives of people in an African country. The Education Center at Chimfunshi not only attracts international primate researchers but also students from America and Europe as well as school classes and their teachers from Zambia. Chimfunshi works closely and regularly with scientists from the Max Planck Institutes for Evolutionary Anthropology (Leipzig, Germany), and for Psycholinguistics (Nijmegen, Netherlands), the Free University of Berlin, the Lincoln Park Zoo in Chicago and Gonzaga University in the U.S. Entry charges are $6 for adults and $3 for children aged 13 and below. Entry is free for children below the age of 3. Please note we do not have credit card facilities and all payments are cash only, paid in Zambian Kwacha. We thank you for your support; your entry fees go directly to the running of the sanctuary and to the care of our chimpanzees. 08:00 – 16:00hrs. | Best viewing times for chimpanzees: 10:00 – 11:30hrs and 13:30 – 15:00hrs. We are open 365 days of the year, including public holidays. Want to escape the hustle and bustle of the city? Why not enjoy the peacefulness of the bush. Chimfunshi offers 3 rustic cottages – each with a twin-bedded room, a double-bedded room, and a rear dormitory. The rooms are basic, but clean and comfortable. Camping and campervans are welcomed, however please note these are unpowered sites. For large groups, Safari tents are available for use as dormitory accommodation. Toilets are environmentally-friendly, long-drop type with a western seat, and ablution blocks are available, with hot water & hot shower facilities from late afternoon. If you are self-catering, there are braai (BBQ) stands available or you can use the communal kitchen, which is equipped with a gas stove/oven, plates, glassware, cutlery, saucepans and fry pans. As a courtesy to other visitors, we ask that all these items are washed and cleaned after use. A communal fridge is available for your use. Please note mobile phone reception is limited at Chimfunshi.